We are what we eat, and what we eat has a profound impact on the planet. When people think about food and sustainability, they typically focus on how the food is produced. Is it, for example, locally sourced, GMO-free, pasture-fed, organic or certified? Just as important, however, is the question of what is eaten. What we eat is rapidly changing around the globe, as people converge toward diets high in calories, protein and animal-based foods. 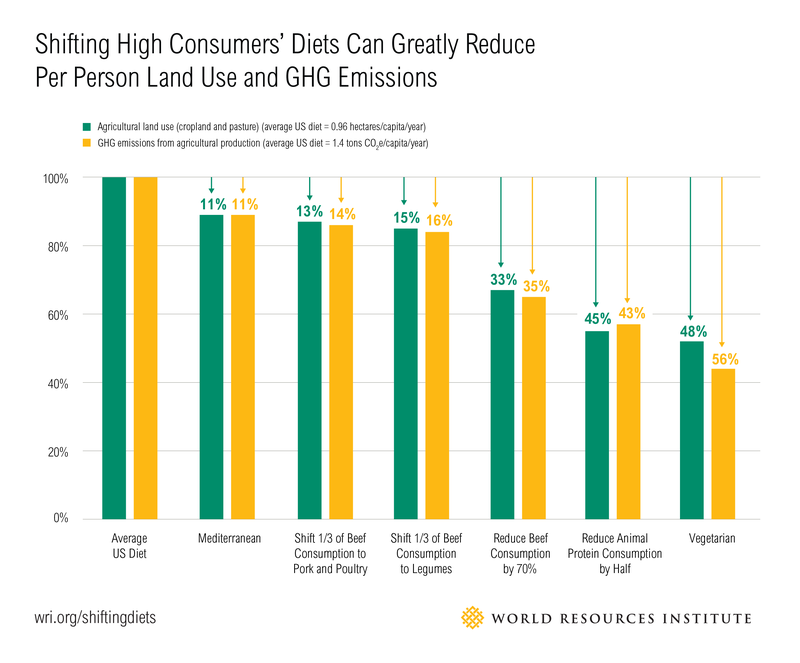 A new WRI paper, Shifting Diets for a Sustainable Food Future, explores these changes and the challenges they pose for food security and a sustainable future. It shows that just small shifts in the choices consumers make can have a huge impact in reducing agriculture’s resource use and mitigating environmental problems—the average American, for example, could cut their diet’s environmental footprint in half just by eating less meat and dairy. To help shift people to more sustainable diets at a large scale, the paper introduces the Shift Wheel, which harnesses marketing and behavior change strategies already used by the food industry to influence consumer purchasing. 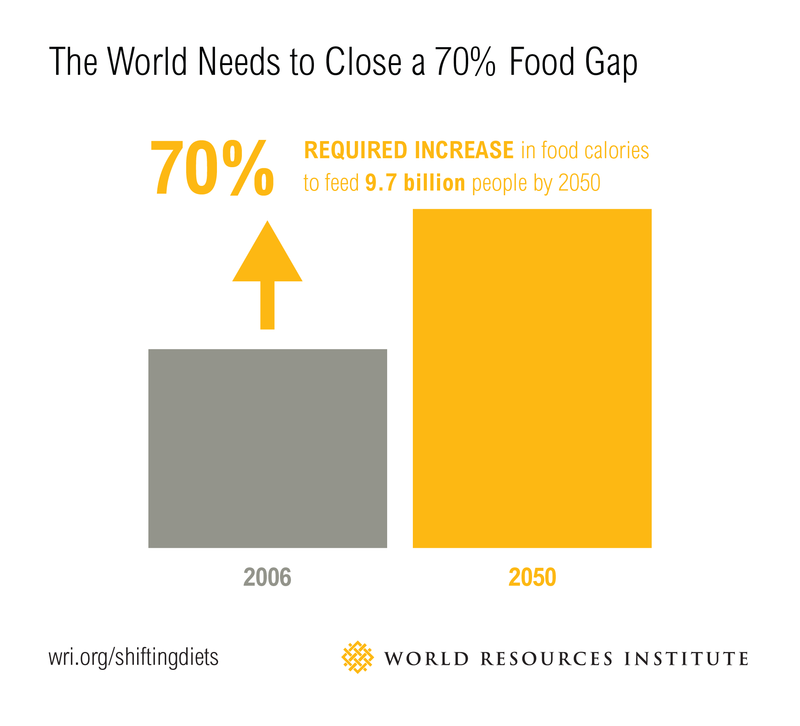 We need to close a big food gap. 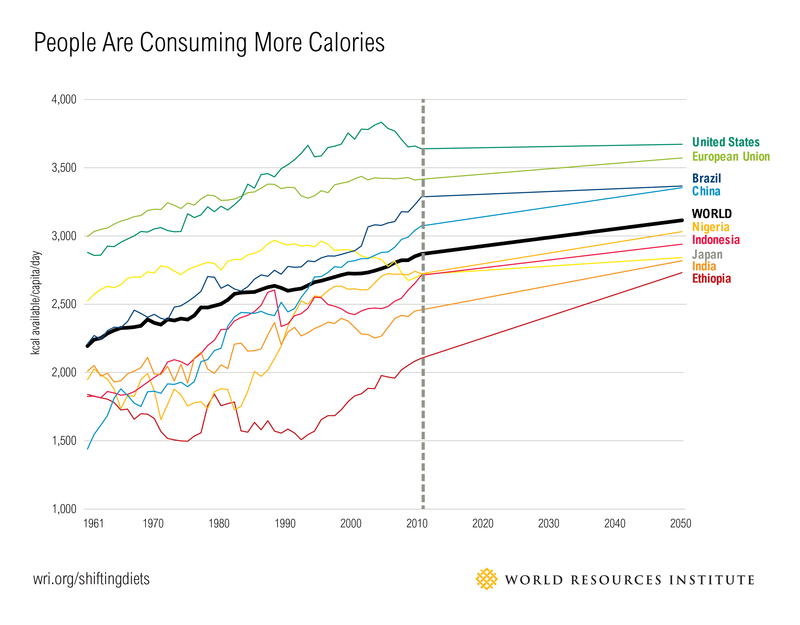 The world needs to close a 70 percent “food gap” between the crop calories available in 2006 and the expected calorie demand in 2050. This gap stems primarily from population growth and changing diets. Global population is projected to grow to nearly 10 billion by 2050, with two-thirds of people living in urban areas. Global diets are shifting toward overconsumption. As nations urbanize and incomes rise, their citizens diversify their diets and consume more calories and more animal-based foods such as beef, dairy, pork, chicken, eggs and fish. Demand for animal-based food is expected to rise by 80 percent between 2006 and 2050, with beef specifically increasing by 95 percent. Some of this growth in demand will support health and welfare gains, but much of it will be driven by overconsumption of food. 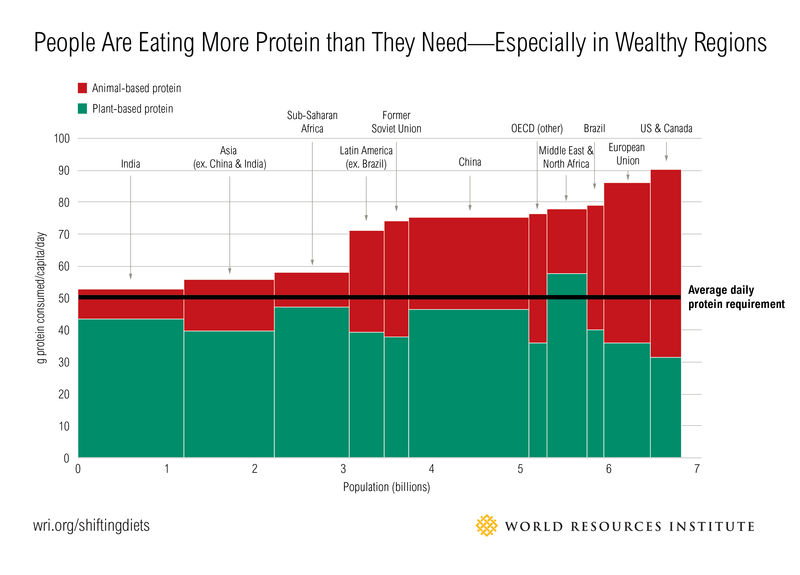 All regions already consume more protein than average dietary requirements—with highest consumption in wealthy regions. 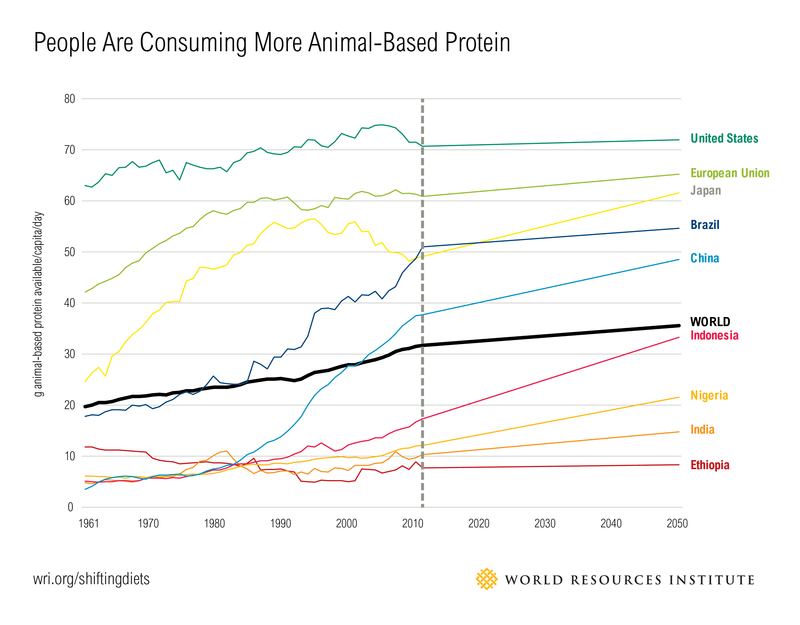 Global average per person protein consumption exceeded dietary requirements in all regions in 2009, with each person consuming on average about 68 grams per day— one-third higher than the average daily adult requirement. In wealthy countries, protein consumption was higher still. For example, the average American man eats nearly 100 grams of protein per day, almost double the amount of protein he needs (56 g). 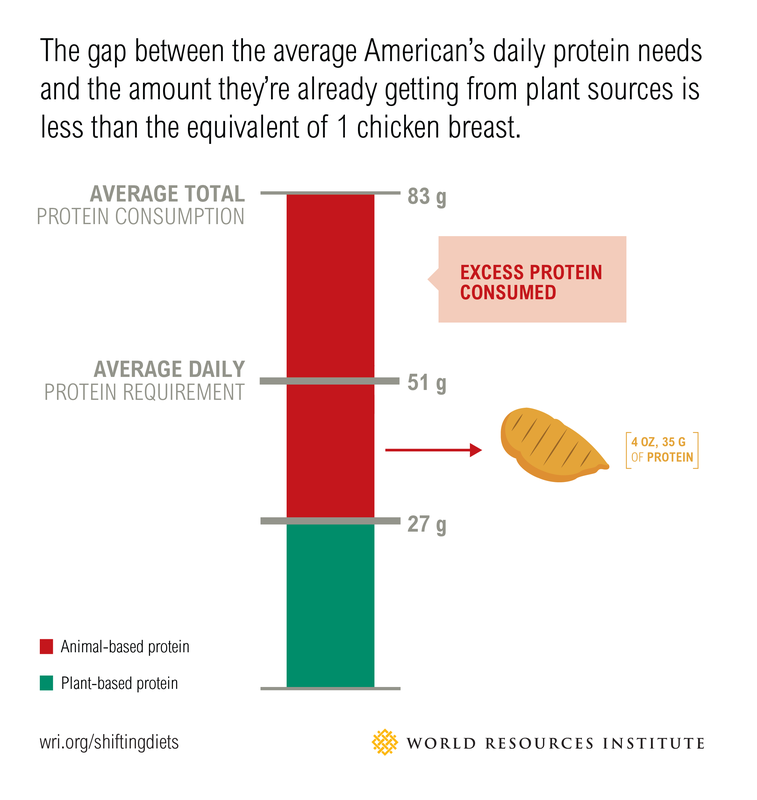 In fact, the gap between the average American’s daily protein needs and amount they’re already getting from plant sources is less than the equivalent of one chicken breast (4 oz, 35 g of protein). Animal-based foods are generally more resource-intensive and environmentally impactful to produce than plant-based foods. Beef production requires 20 times more land and emits 20 times more greenhouse gas emissions per unit of edible protein than common plant-based protein sources such as beans, peas and lentils. Chicken and pork are more resource-efficient than beef, but still require three times more land and emit three times more greenhouse gas emissions than beans. When it comes to resource use and environmental impacts, the type of food eaten matters as much, if not more, than how that food is produced. The biggest beef is with beef. Beef is extremely inefficient to produce, as cattle consume a huge amount of calories and protein in order to produce a relatively small amount of calories and protein for human consumption (sheep and goat are similarly inefficient converters of feed to food, but are eaten on a much smaller scale globally). 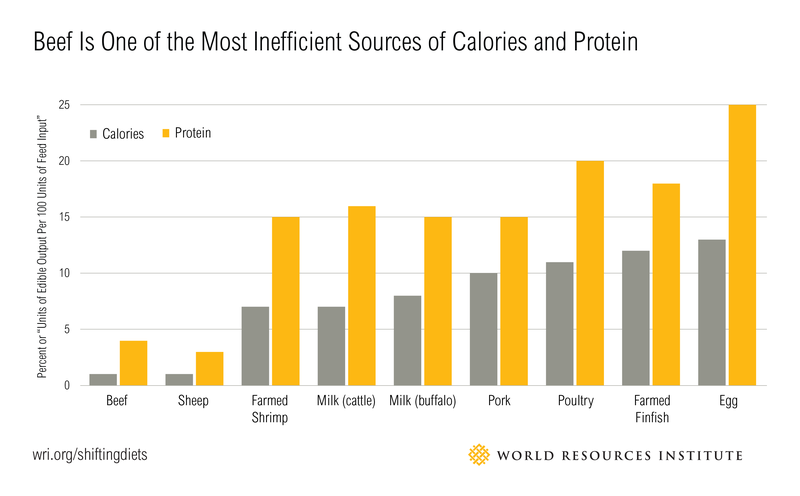 As a result, beef production requires large quantities of land and water per unit of protein or calorie consumed. One-quarter of the earth’s land (excluding Antarctica) is used as pastureland, and beef accounts for one-third of the global water footprint of farm animal production. Beef also has a disproportionate impact on climate change. Ruminants, of which cattle are the most common, accounted for nearly half of all agricultural production-related greenhouse gas emissions in 2010. If cattle were able to form their own nation, they would rank third behind China and the United States among the world’s largest greenhouse gas emitters. You don’t have to become a vegetarian or vegan to make a difference. The average American could cut their diet-related environmental impacts by nearly one half just by eating less meat and dairy. Working with the French agricultural research institutions CIRAD and INRA, we modelled the effects of several diet scenarios. When applied to the average American diet in 2009, the ambitious animal protein reduction scenario (which cut people’s meat/dairy/fish/egg consumption in half) reduced per person land use and agricultural greenhouse gas emissions by nearly one-half—or almost as much as the vegetarian scenario (which eliminated meat and fish, but increased dairy consumption relative to the average American). 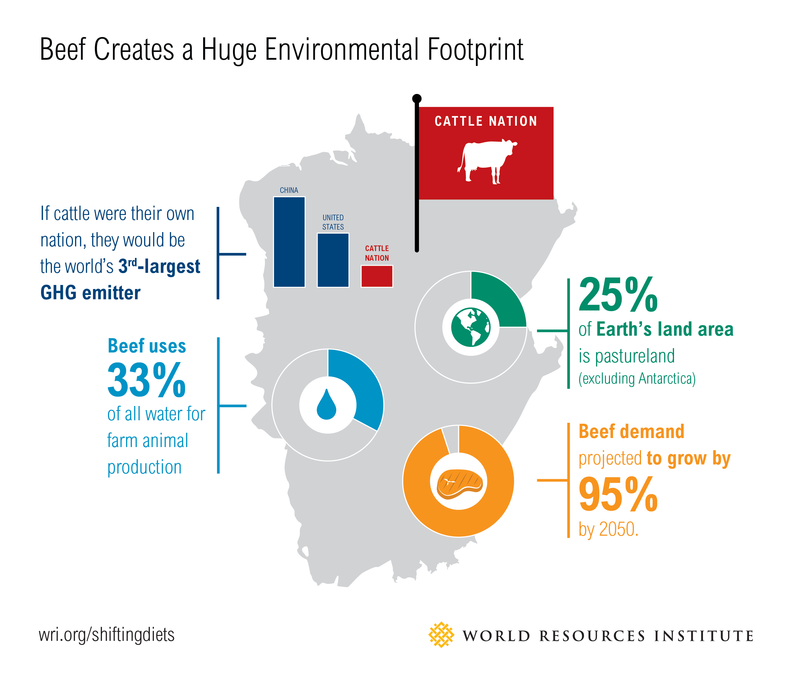 The beef reduction scenarios reduced per person land use and greenhouse gas emissions by 15 percent (replacing one-third of beef consumption with other meats or legumes) to 35 percent (reducing beef consumption by 70 percent, down to the world average level). Small shifts in diet choices can make a huge impact globally. When applied globally to populations overconsuming protein or who are high consumers of beef, the ambitious animal protein reduction and beef reduction scenarios could spare between 310 and 640 million hectares (766 million to 1.6 billion acres) of agricultural land, respectively. For the ambitious animal protein reduction scenario, the land spared is roughly two times the size of India. This is more than the entire area of land converted to agricultural use over the past 50 years. The corresponding avoided land use change-related greenhouse gas emissions was 168 billion tons of CO2 equivalent—more than three times total global emissions in 2009! 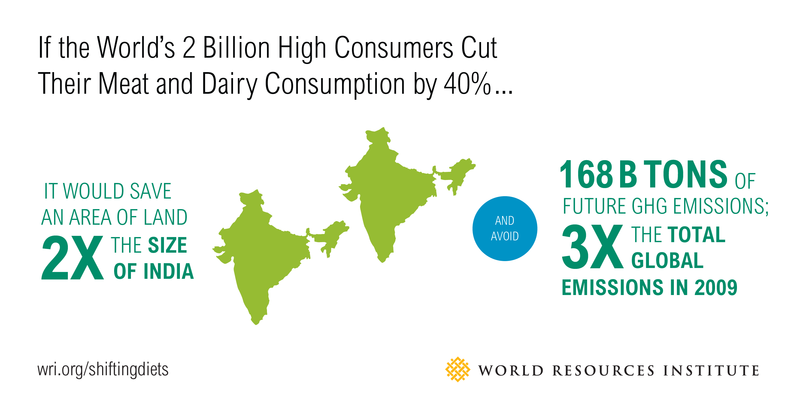 As a result, reducing consumption of animal-based foods among the world’s wealthier populations could free up significant amounts of land—possibly enabling the world to feed 10 billion people by 2050 without agriculture further expanding into forests. 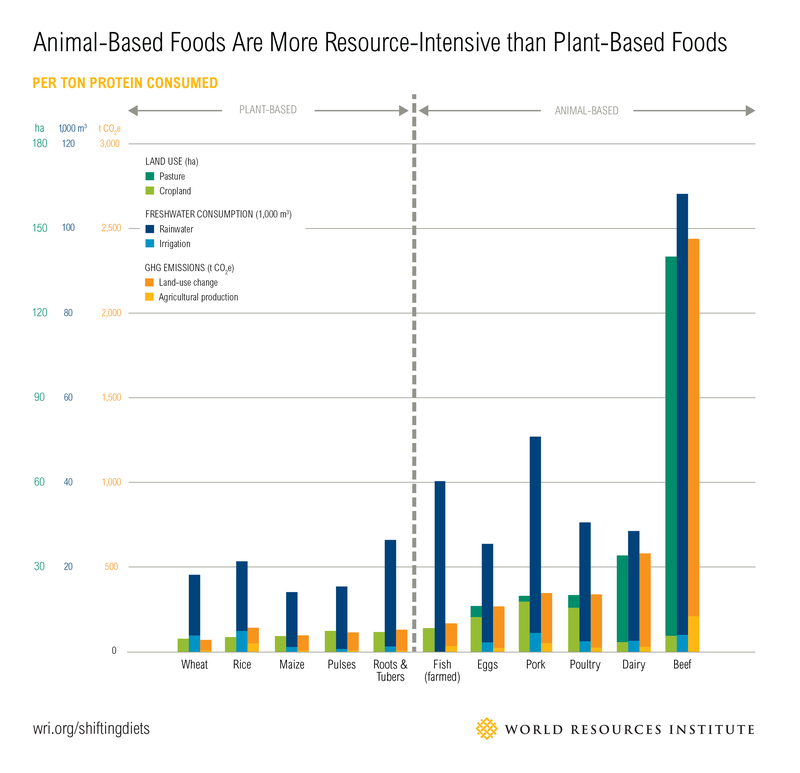 To make sustainable diet choices easier for consumers, WRI introduces a new protein scorecard ranking foods from lowest (plant-based foods) to highest impact (beef), based on associated greenhouse gas emissions per gram of protein. 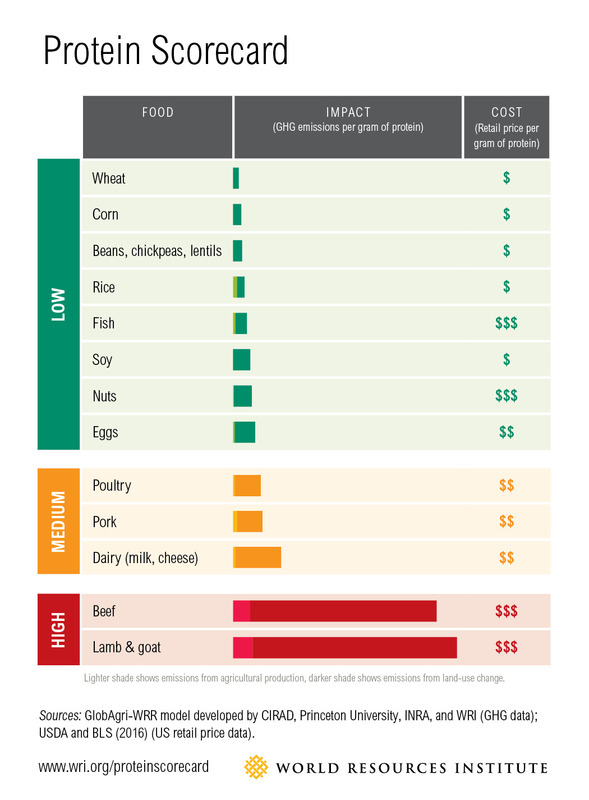 Encouragingly, some of the lowest-impact foods are also the cheapest to buy. Shifting billions of people’s diets requires larger, systemic changes. Efforts to shift diets in the past have largely depended on information and education, including calling for people to become vegetarian or vegan. These efforts haven’t reached scale because they don’t work in step with how people purchase and consume food. Instead, we need to engage leaders in the food sector to experiment with new approaches that increase the share of plant-based protein in consumer choices. 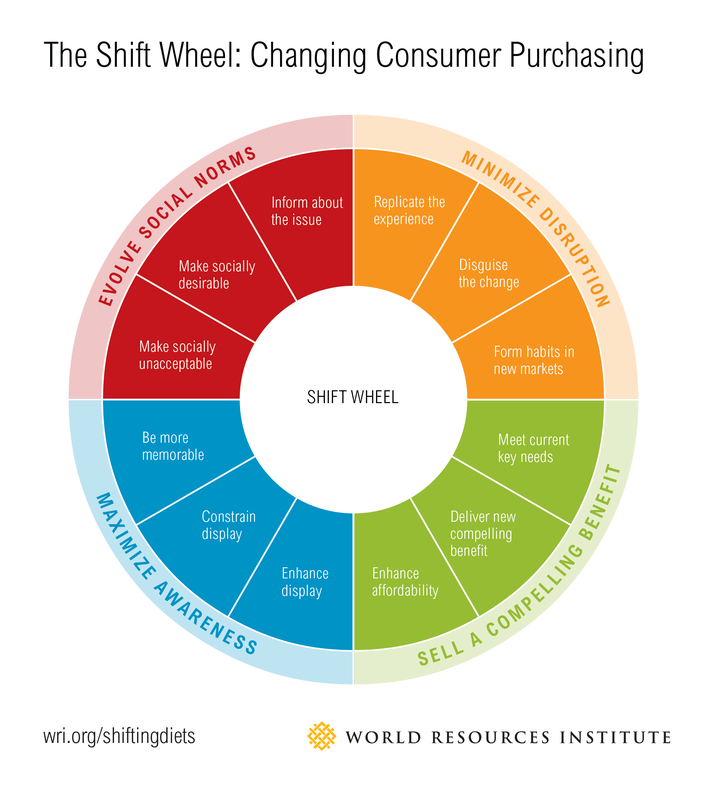 WRI and partners reviewed more than a dozen successful consumption shifts that have already occurred and created a “Shift Wheel.” The Shift Wheel comprises four complementary strategies: minimize disruption, sell a compelling benefit, maximize awareness and evolve social norms. As a next step, WRI will partner with the food service industry to test the Shift Wheel and scale successes. LEARN MORE: Download the full publication, Shifting Diets for a Sustainable Food Future.